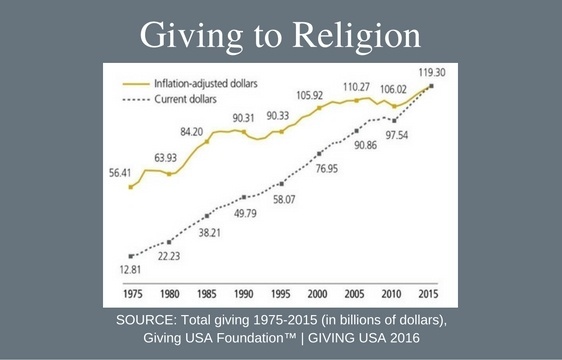 The good news is that after recording a fifth straight year of growth, giving to religion is at its highest level ever, and as a subsector it remains the largest recipient of charitable dollars in America. Unfortunately, giving to religious organizations is growing at a slower rate than most other subsectors (third slowest out of nine subsectors over the past five years) and continues to shrink in terms of the share of total giving religious organizations are garnering (32 percent in 2015 compared to 54 percent in 1985). A number of studies also suggest that the current growth is being driven by existing donors increasing their giving rather than religious organizations attracting new donors. This reliance on existing religious donors may be having a disproportionate and negative impact on many mainline congregations and traditional religious organizations, where the median congregant/donor age continues to rise as overall membership declines. Younger Americans, though they are more likely to consider themselves “non-religious,” are still potential donors to religious organizations. A study by the Pew Research Center found that Millennials are just as likely to hold spiritual beliefs as older generations, though they are less likely to express that through weekly church attendance. These shifts create both challenges and opportunities for religious congregations and organizations as they craft plans for growing their fundraising over time. Openly discuss the importance of giving and the scriptural basis for giving expectations with congregants/donors. Studies of religious and secular organizations have repeatedly shown that giving is more likely to increase in an atmosphere where it is regularly discussed as part of the organization’s culture. Go beyond nondescript conversations of tithing and quantify the impact of gifts. Emulate the transparency of fundraising from secular nonprofits by illustrating to members/donors what gifts of different levels make possible in terms of ministries and programs. Emphasize the importance of your organization’s faith traditions, but also establish their importance in the modern context. Older existing donors value tradition, but also need to see a road forward. Younger donors are open to spiritual concepts, but want connectivity to modern experiences and societal needs. Create online giving opportunities. Data from Blackbaud found that online giving to its partnering religious organizations grew by 8.8 percent in 2015, more quickly than overall giving to those same groups. Online giving has become an expectation of donors even in religious settings. This platform also provides an avenue to generate recurring donations even when donors do not find their ways into pews every week. Develop and discuss planned giving opportunities for members/donors. An aging donor base presents powerful opportunities to discuss a member/donor’s desires to leave a legacy. The Nonprofit Research Collaborative’s Winter 2016 Nonprofit Fundraising Survey found that 67 percent of religious organizations polled received bequests in 2015, trailing only higher education in the frequency of receiving such gifts. If your organization has not created opportunities for your members/donors to give planned gifts, you should.